For several decades, Holland Molds of Wadena, Minn., has been producing plastic injection molds primarily for the medical market. The company also supports businesses in the automotive, aerospace and recreational industries. When it reached the limitations of its previous 10,000-rpm vertical machining center, the company began to look for high-speed milling capabilities that would maintain accuracy and reliability while improving quality. Years ago Holland Molds realized that high-performance machining centers were an investment that would give the company peace of mind, when it came to achieving the accuracy and reliability for which Holland is known. Makino equipment has stood the test of time, with one of the company’s first Makino machines having been on its shop floor for nearly 30 years. 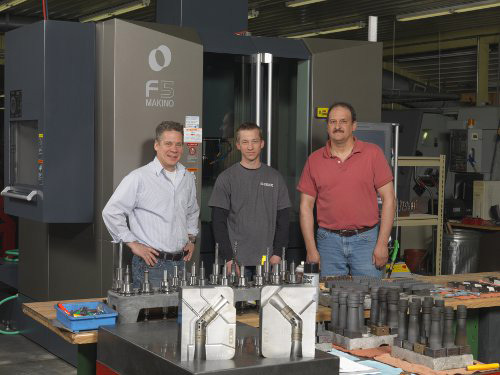 Based on this proven record, the company again turned to Makino, purchasing a new F5 high-speed milling machine that it hoped would maintain its shutoff quality in the precision injection molds it builds. The F5 delivers twice the spindle speed of Holland’s previous machines, providing an extra level of efficiency and helping to reduce finishing times. The rigidity and addition of heat-shrink tool holders have helped Holland maintain precise finish requirements. Cycle times have been decreased by an average of 25 to 30 percent. In some applications, cutting times have been reduced by up to 50 percent while maintaining tolerances of plus or minus 0.0002 inches. The company has also had a 25 percent reduction in EDM processes. If a mold can be produced through high-speed milling rather than burning, then Holland has found that it can be more competitive in its quotes. This approach also frees up the company’s EDM machines for other work. The Makino Professional 5 (Pro5) control offers easy data management for its projects and enables operators to load programs remotely. Multiple workpieces can be prepared in a single setup, and the machine can be preprogrammed for each job for unattended operation.